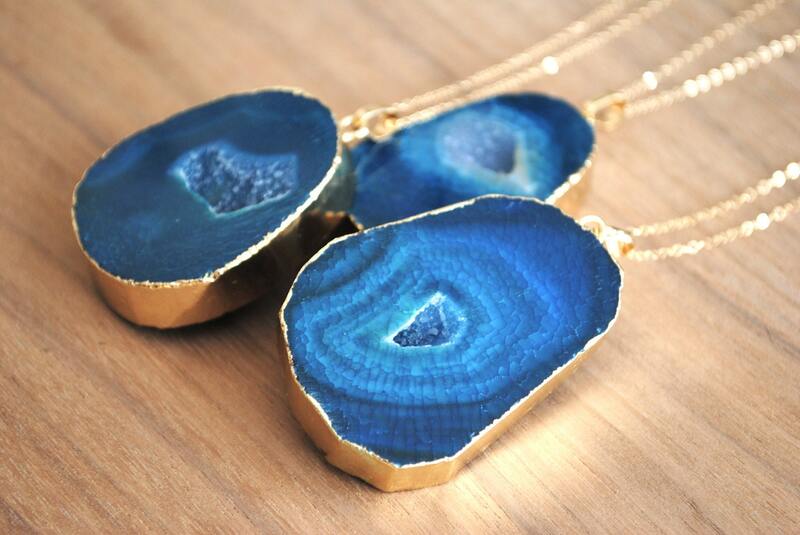 ⊿⊿ This necklace features a beautiful genuine raw teal agate druzy slice that is edged in 18 karat gold plating and it hangs from a delicate 30" genuine 14 karat gold filled chain. It closes with a spring ring. This is the only length it comes in. ⊿⊿ Most agates occur as geodes which are formed in volcanic lava which contain gas bubbles that fill with siliceous matter. Variations in this matter (such as water), or the conditions under which the deposit occurs, can cause corresponding variations in the layers, so you will see bands of chalcedony that alternate with layers of quartz. These slices are cut thick and feature crystallization in the center. This color agate is a dyed color (actual color will vary from the colors on your screen). ⊿⊿ The pendants are about 2" in length and 1 1/4" to 1 1/2" in width and is unique and one of a kind and will feature natural variations and imperfections - all organic to the raw nature of the stone.